Everlast is one of the largest and best known martial arts accessory brand in the world and we review 3 of their top punching bag stands. 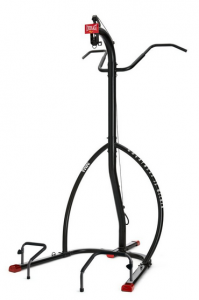 If you are looking for a Everlast punching bag stand you should definitely read the reviews. Each stand has it’s advantages and disadvantages, which we discuss in detail below. The 2 Station Everlast Heavy Bag Stand is a rugged steel constructed stand designed to hang both a heavy bag and a speed bag. It weighs approximately 72.2 pounds without any bags or added weight. It is relatively easy to assemble. There are 3 pegs on the base that need added weight plates in order to prevent it from sliding around the training or tipping over while in use. You can also bold the stand to the floor. The stand is designed to hold punching bags up to 100 pounds. Using this Everlast punching bag stand to hit a hanging bag is ideal for working in increasing your punching power and testing your conditioning and endurance. Of course, like all punching bag stands, it’s not great to use if you want to practice changing angles or circling an opponent. This is because you don’t have complete 360 degree access to the entire bag due to the stand restricting movement. Overall we think this stand is pretty good and comes in at a decent price point. The Everlast MMA Omnistrike Heavy Bag Stand is made from steel and can hold a heavy bag weighing up to about 100 pounds. The stand itself weighs approximately 54 pounds without any bags or added weights. Like other punching bag stands, it also has 3 base pegs intended to put weight plates on in order to ensure stability. It features a pull up bar on the opposite side from the heavy bag, adding an extra dimension to training routines. What separates the Omnistrike Heavy Bag Stand is that the hanging mechanism allows for the heavy bag to be easily detached and reattached. MMA athletes will especially appreciate this feature, as it allows the striker to quickly bring the heavy bag to the floor and work MMA style ground-and-pound drills and then easily reattach to the stand and continue using it as a traditional heavy bag. The weight pins are arranged in such a way as to allow the striker to kick without concern for a stray toe hitting the steel or a weight plate. This leads to a small issue, however, in that the pegs are closer to the supporting beams than on other punching bag stands. This means that the weight plates cannot be too large or else they will rub on the support beams or not fit. Thus, you will need more smaller weight plates when using this stand. The Everlast MMA Omnistrike stand is a solid, well designed, and dynamic product designed with the aspiring MMA fighter in mind and we highly recommend it to this crowd. 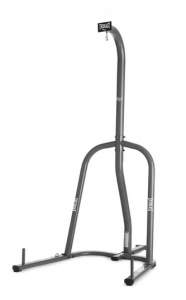 The Everlast Heavy Bag Stand is made out of heavy duty, powder coated steel tubing. It is easy to assemble and can hold a heavy bag up to 100 lbs. The stand itself comes in at about 55 pounds. Like other stands, there are 3 pegs on which to put weight plates to add stability. You will need to purchase the weights separately, so keep this in mind. 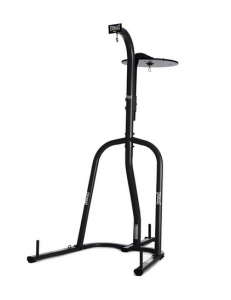 This Everlast punching bag stand is one of the more basic stands, and it doesn’t have any additional features such as a speed bag platform or chin-up bar. As such, it tends to be way less expensive than any of the other models, like the Omnistrike or the 2 Station Stand that we reviewed above. This set up is fine for many users, so if you are just looking for a stand with basic features then this is a good choice. The stand is a well constructed and durable an is built to last a long time. Using a bag on this stand is ideal for developing power and training endurance, however like most heavy bag stands it limits the ability to work angles and footwork, as the striker does not have access to the full 360 degrees of the bag. There’s not much more to be said about this product other than it’s a good basic choice at a decent price. If you are looking for a basic, cost effective, durable heavy bag stand then we definitely think you should check it out. If you want a stand, but aren’t convinced about any of the stands above then you can check out the heavy bag stand reviews we did from Century and Title. The reviews go into detail about the benefits and negatives of other stands. You can also take a look at our homepage for a list of highly rated heavy bags. You can click to see review of more popular bags here.